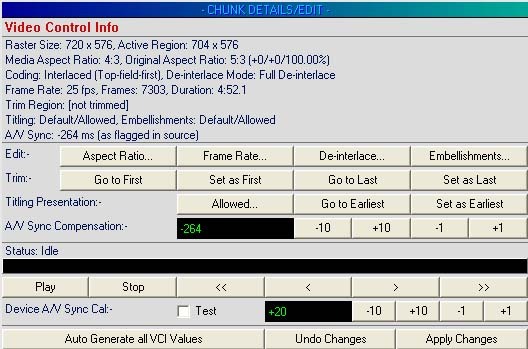 The VCI chunk displays the video properties of a video item, and allows you to make changes to the video properties if required. In most cases, Ots Studio will determine the correct properties for the video file. If you need to override the settings that Ots Studio has assigned to the video portion of the item, the following options are available. Note: This calibration should be done before using the item A/V Sync Compensation feature above. To set the VCI chunk values back to default, as they would be after the item was first imported to Ots Studio, click on the Auto Generate all VCI Values button.